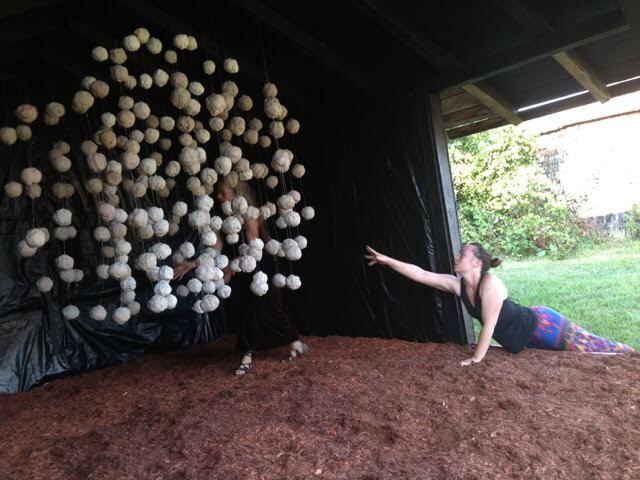 This installation – which I installed for the “Grounding” SculptureFest 2016 at King Farm in Woodstock, Vermont – continues a body of work that concerns multiple elements creating a larger form. I was curious about finding a way to float clay in the black box of what I like to call the zen pagoda. I like the idea of taking something earthbound and floating it in the air. In creating this piece I was also inspired by images of asteroid belts. This clay has experienced many uses: other installations, as casting form for sculptures, masks and giant puppets. It is unfired and will be recycled eventually. The balls are hanging on 40 lb test monofilament. 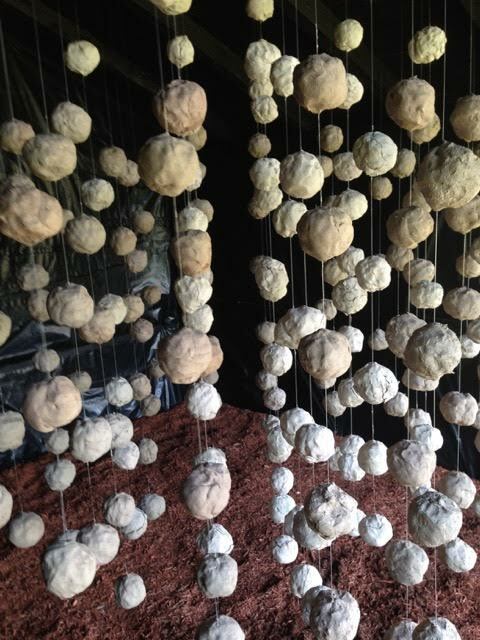 As I worked on this piece the process of applying these 200 clay balls was additionally a type of meditation. I could listen to the wind blow, people talking, teams practicing down at the high school, the town lunch horn blow, grass cutting, art being created, crickets chirping and the birds singing. For four days this was my grounding to this place, my way of being present to each moment. It is no secret that being aware of these moments is the root of happiness. During the 3 September opening, it was a pleasure to have dancers Tracy Penfield and Chelsea Palin choose to move through and with my piece. For several years now I have enjoyed the space and freedom offered by the magical space that is King Farm. This place is a fantastic art lab, where artists can experiment and float new ideas. It is a place where time has worked its special entropy into these buildings and land. I feel so lucky to be a part of this fabric that is the evolving history of King Farm. It has been such an honor to pull these 20 artists together for this SculptureFest 2016 show we are calling “Grounding.” As you will see, King Farm, in Woodstock, Vermont – with its forests, pastures, pond, topography and classic barn buildings and sheds – is a wonderful tableau for installations and sculpture. 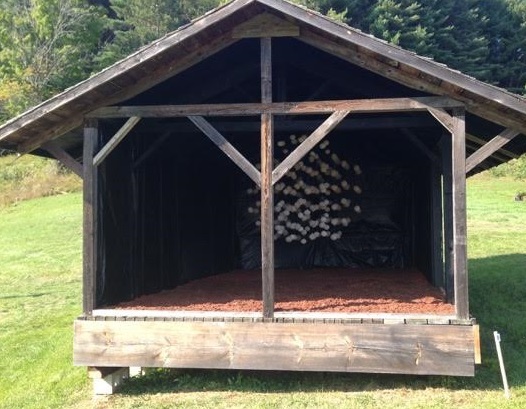 Thanks to the Vermont Land Trust for allowing us to use this unique place to show fresh creations. In fact, many installations were created in situ and some are still curing! Special appreciations are also very much due to Peter and Charlet Davenport for all the hard work they have put into making this such a special venue for so many years. Images of the installations can be viewed on the SculptureFest website by clicking on the respective artists’ name.